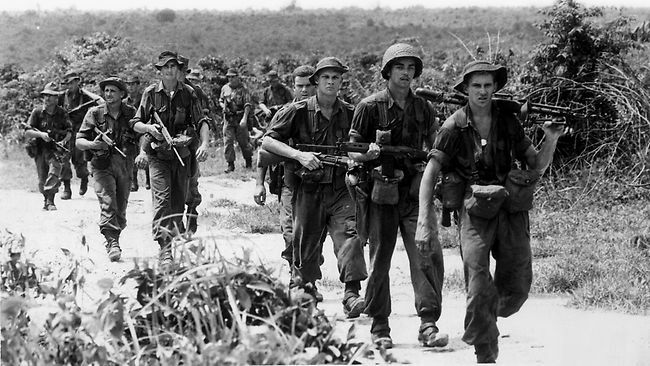 Australian soldiers trek through Vietnam. Australia and Canada, two of America’s allies fought along side American troops in Vietnam. I thought they were worthy of being mentioned here, beginning with Australia. Keep an eye out for Canada to follow soon. Australia’s involvement in the Vietnam War, beginning with a small commitment of 30 military advisors in 1962, increased over the following decade to a peak of 7,672 Australian personnel following the Menzies Government’s April 1965 decision to upgrade its military commitment to South Vietnam’s security. By the time the last Australian personnel were withdrawn in 1972, the Vietnam War had become Australia’s longest war, and was only recently surpassed by Australia’s long term commitment of combat forces to the War in Afghanistan. It currently remains Australia’s largest force contribution to a foreign conflict since the Second World War and was also the most controversial in Australian society since the conscription controversy during the First World War. Although initially enjoying broad support due to concerns about the spread of communism in Southeast Asia, a vocal anti-war movement developed in response to Australia’s programme of conscription. The withdrawal of Australia’s forces from South Vietnam began in November 1970 when 8 RAR completed its tour of duty and was not replaced. A phased withdrawal followed, and by 11 January 1973 Australian involvement in hostilities in Vietnam had ceased. Nevertheless, Australian troops from the Australian Embassy Platoon remained deployed in the country until 1 July 1973, and Australian forces were deployed briefly in April 1975, during the Fall of Saigon, to evacuate personnel from the Australian embassy. Approximately 60,000 Australians served in the war; 521 were killed and more than 3,000 were wounded. You might like to visit Ian, an Australian veteran of Vietnam.